A while ago while I was out shopping at RiteAid, I came across Wet n’ Wild’s line of “Fastdry” nail polishes. 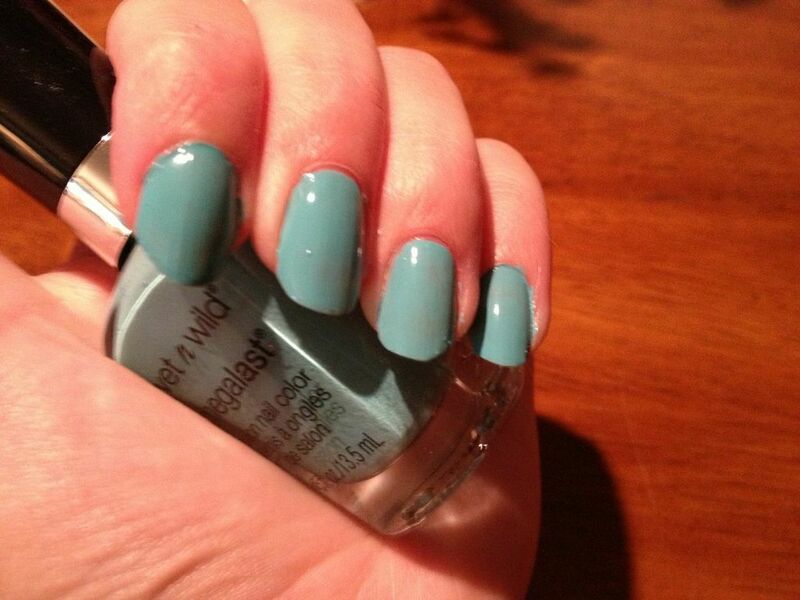 This brand is a line released by Wet n’ Wild, very similar to Sally Hansen’s Rapid Dry color line. I picked up two colors to try out. I got a shimmery, foil-like orange, and a frosty blue. Both polishes are packaged in a cylindrical bottle with flattened sides, and a black cap, and retail for $1.99 (a better bargain than the Sally Hansen polishes, which sell for about $4.99 a piece). So without further ado, let’s get started on the polishes! 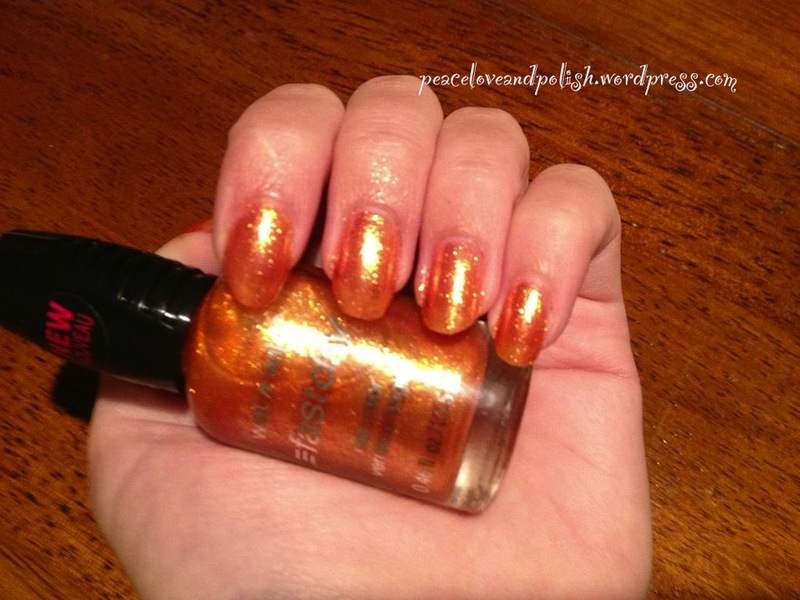 “9.0.2.1.Orange” is an orange based foil polish with gold shimmer running through it. Application-wise, this polish is a gem. It’s very fluid and applies evenly, and self-levels so that there is virtually no patchiness. It is on the sheer side, so you’ll have to build it up if you want to hide the VNL. 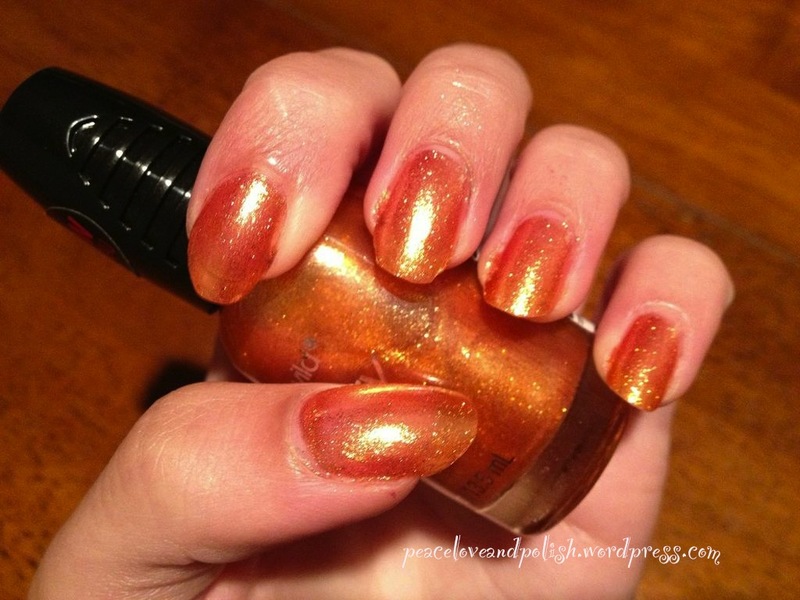 The pictures below are 3 coats of 9.0.2.1.Orange, with no topcoat. “Saved by the Blue” is a deep, vibrant cobalt blue. It’s a bit frosty, so brushstrokes are somewhat of an issue, but really aren’t too bad. I had some issue with the polish pulling away from my tips as it dries, so beware of that. Application-wise, it was thicker than 9.0.2.1.Orange, but not unmanageable. 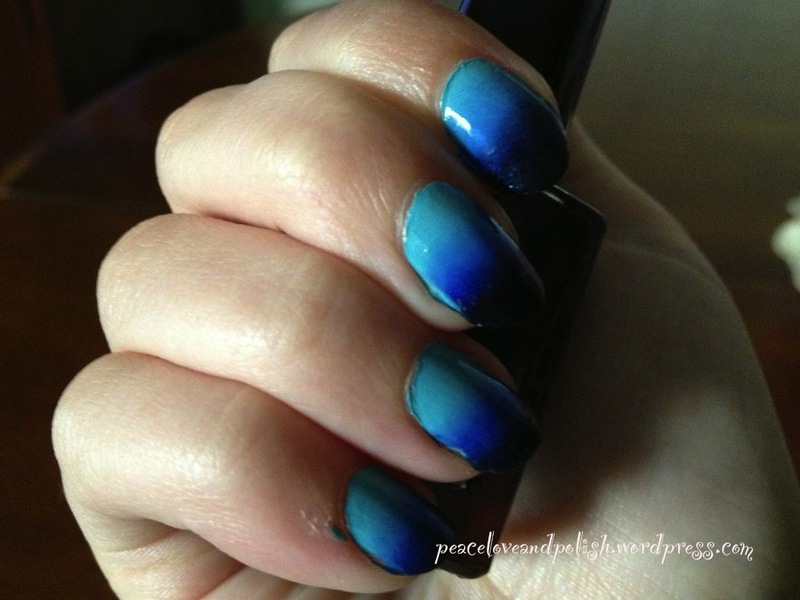 I’ve actually used this color in my Blue Gradient nails and my water marble with my mom. It’s an all around good blue to have. 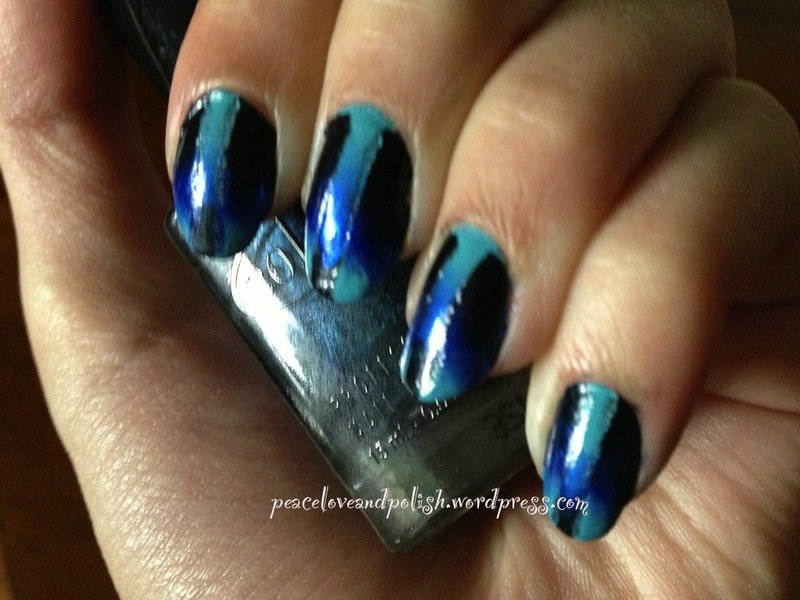 The pictures below have 2 coats of Saved by the Blue, no topcoat. I’m not really sure why the pictures turned out so yellow, but the polish color is fairly accurate. It’s just a smidge brighter in real life. Overall, I’m pretty pleased with these colors. The blue was definitely a faster-dry polish than the orange. Saved by the Blue was dry to the touch in about 2-3 minutes, while it took 5-6 for 9.0.2.1.Orange. The website claims that one coat of these polishes dries in 60 seconds, and that didn’t hold true. I’m pretty patient with my manicures, though, so it doesn’t bother me too much. For the price, I’ll definitely take it! 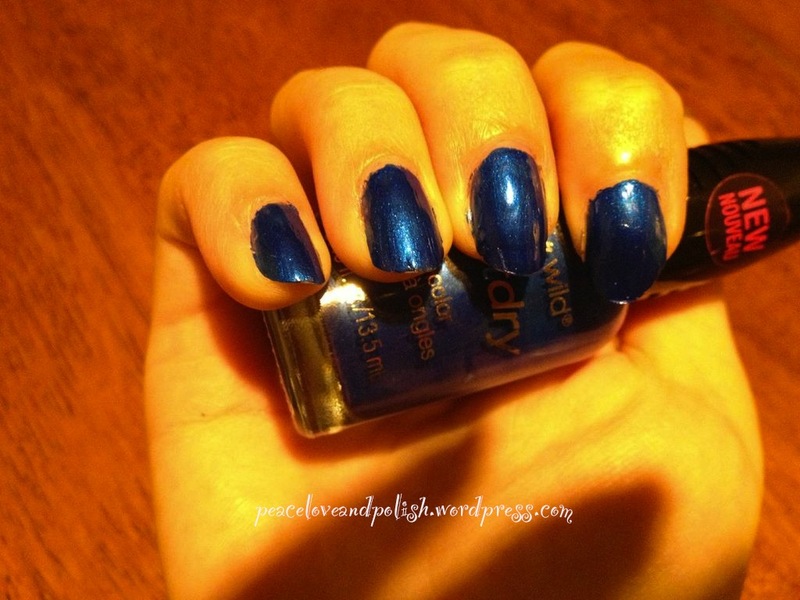 Wet n’ Wild Fastdry polishes are sold at most drugstores, like Walgreens, CVS, and RiteAid, and can be found on their website, here. 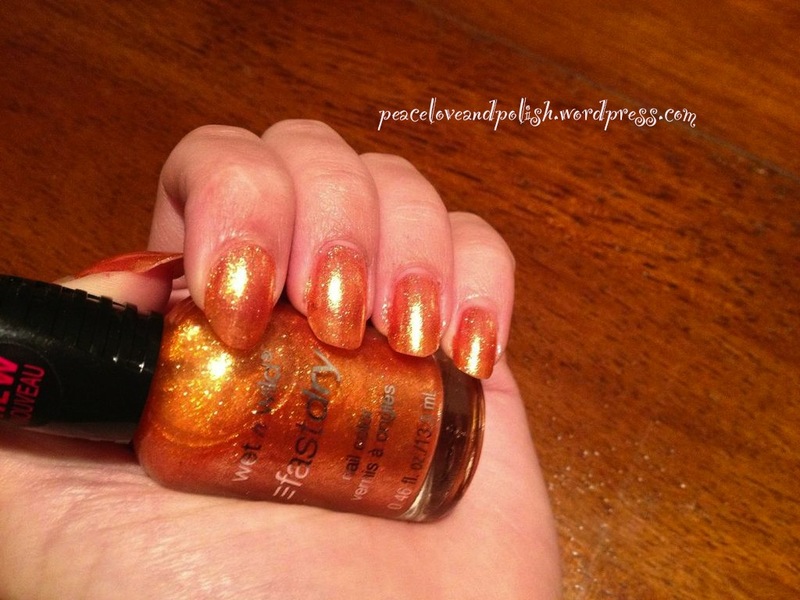 So what do you think of these polishes? Will you be picking them up? And do you think I should review more Wet n’ Wild polishes from this line in the future? 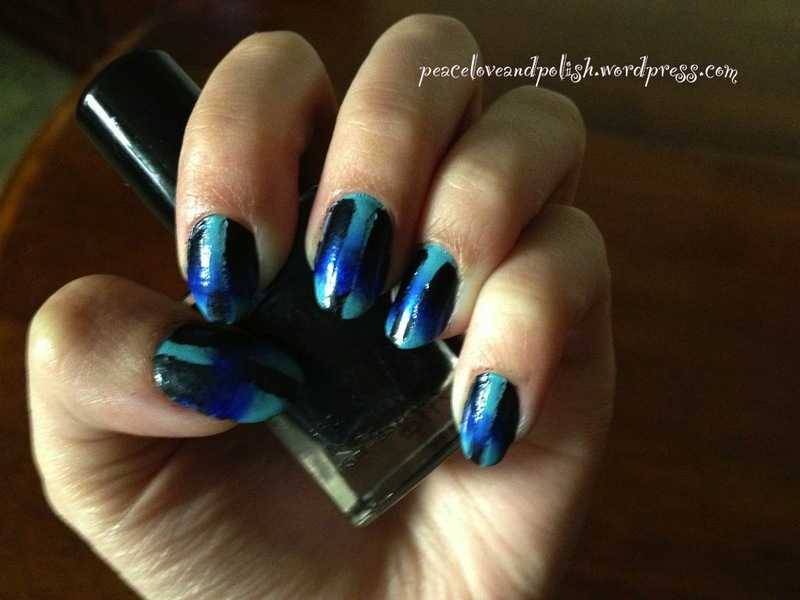 Nail Art- Blue Gradient, Two Ways! So today I have a fun nail art design that I did in two different styles. 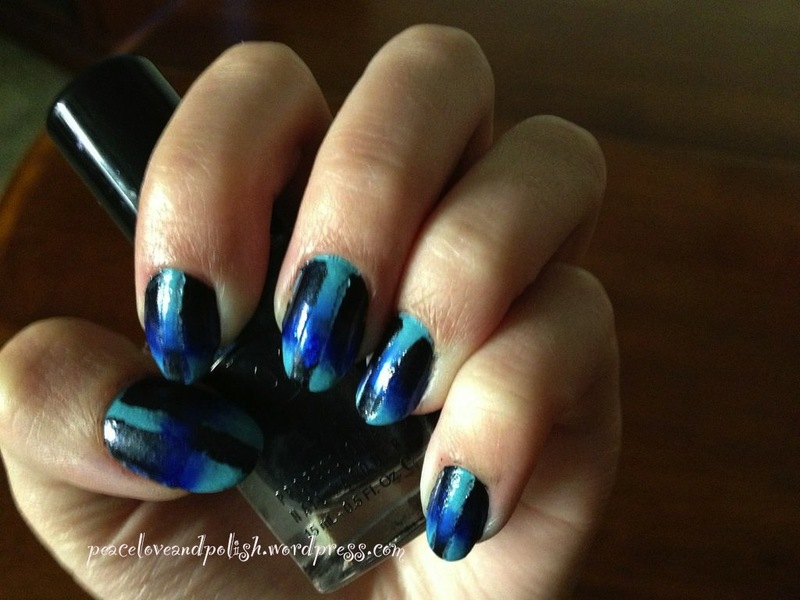 I did a classic “gradient” nail art design, using 3 shades of blue, and then a “reverse gradient” nail, in which I have one gradient going in one direction, and a stripe down the center in the reverse direction! I was originally inspired to try a version of the “reverse gradient” nail from Simplelittlepleasues, a youtube nail art channel. If you want to check some of her designs, just click here! She’s also incredibly talented at water marbles! So the first “base” design is the gradient. 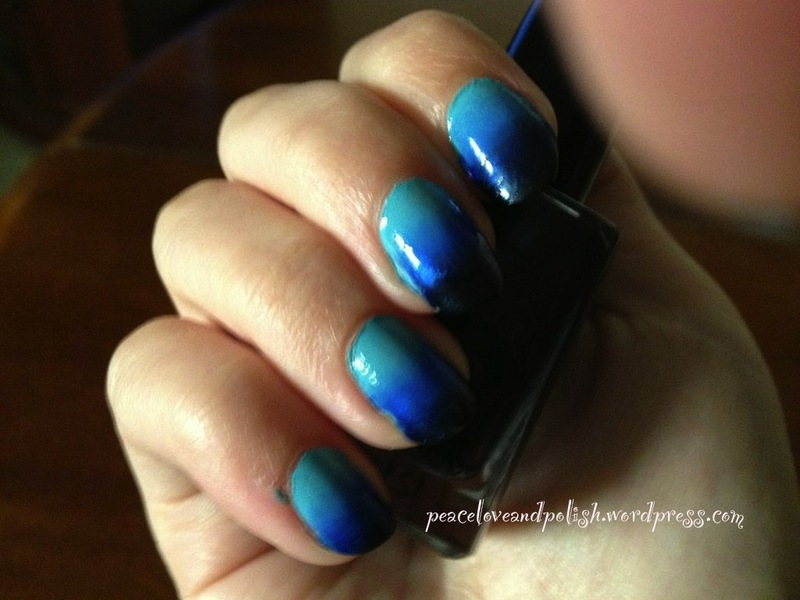 To create this look, I used 3 colors of nail polish: The lightest blue is Wet n’ Wild Megalast Nail Color in “I Need a Refresh-mint“, the middle-colored blue is Wet n’ Wild Fastdry Nail Color in “Saved by the Blue“, and the darkest blue (a shimmery navy) is Color Club Nail Lacquer in “043“. 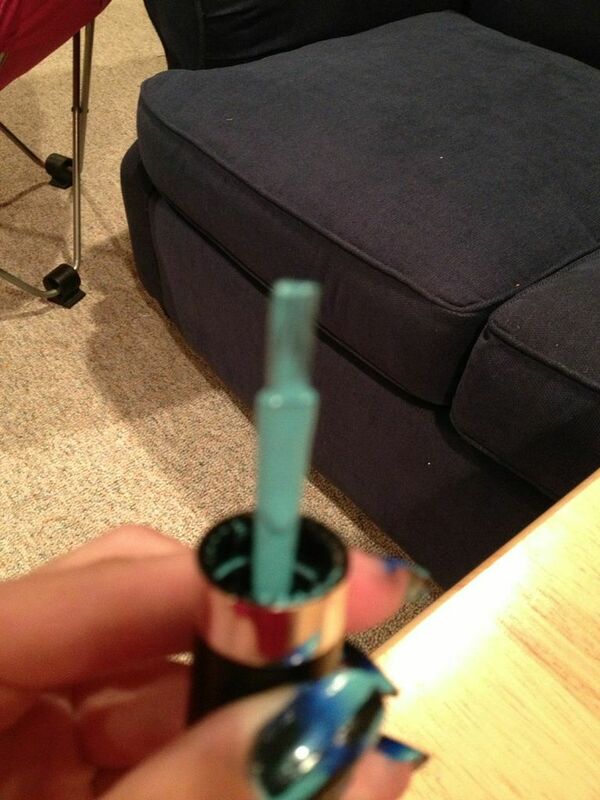 I started with 1 coat of “I Need a Refresh-mint” on all of my nails, and let it dry completely for about 20 minutes. Then, I took a makeup sponge, and layer the 3 colors on it, try to overlap the colors so that when I dab it on my nails, the colors will blend. I’ll include a picture of the sponge below. After preparing the sponge, I dabbed the polish onto my nails, with the lightest color near my cuticle and the darkest by my tips, in side to side motions in order to blend the colors together. Don’t worry if it looks messy the first time, because you’ll need 2-3 layers of the gradient to get it dark enough. 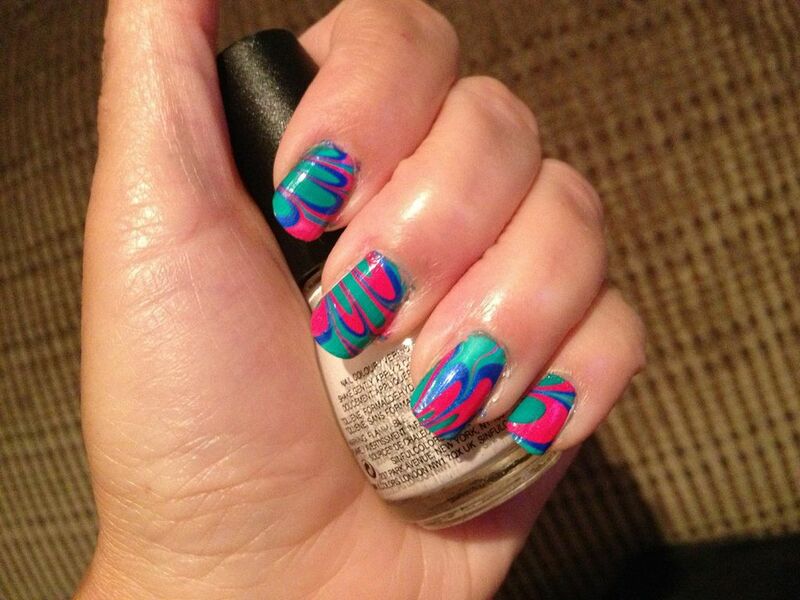 If you want to keep your cuticles clean, you can tape them like you would in a water marble nail art. However, I opted to leave them naked, and remove the mess with a q-tip dipped in acetone later. 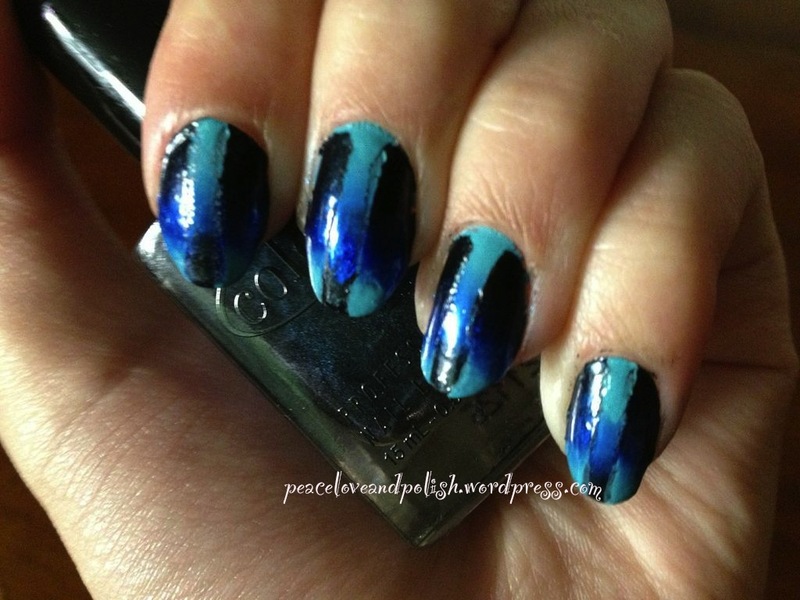 Once you’re satisfied with your gradient layers, use a topcoat over it to smooth out the lines. You should be left with a smooth gradient of blue bliss! Pictures below have 1 coat of Sally Hansen Diamond Strength Nail Color in “Flawless” overtop them. Now, on to the second design! 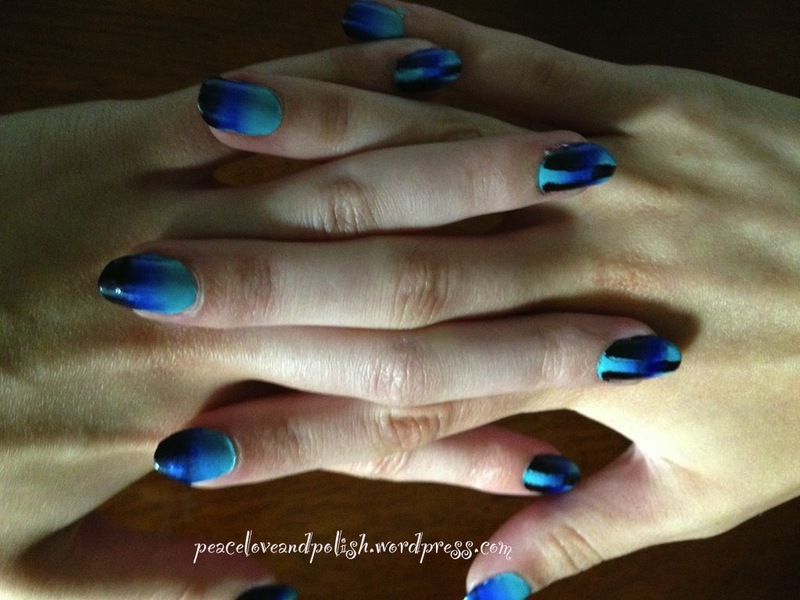 So what do you think of these two stylish nail designs? 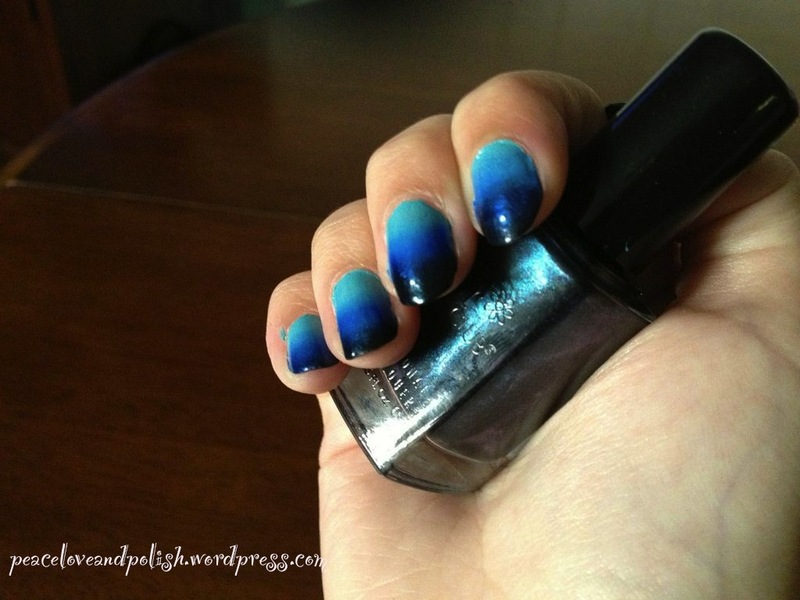 Have you tried a gradient nail art before? 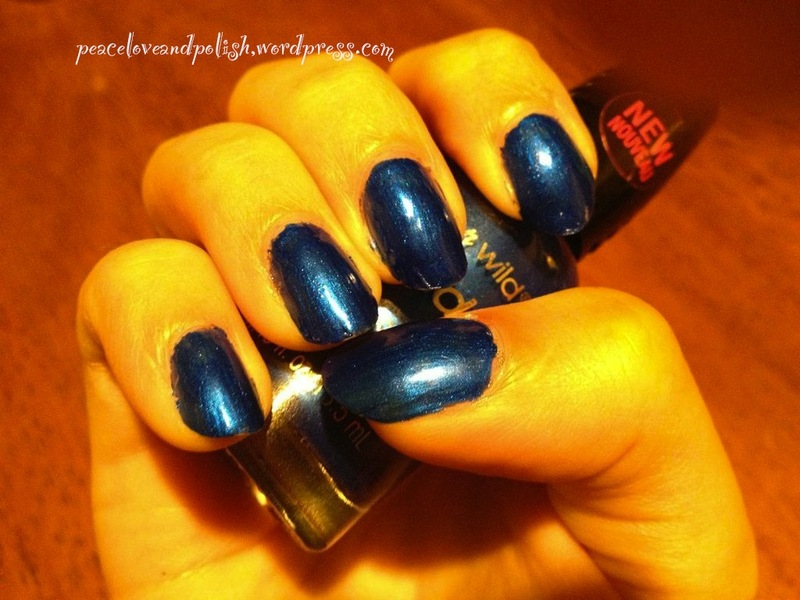 Today I have for you a Wet n’ Wild Megalast polish I picked up while I was in Port Canaveral, Florida, while on my cruise. We stopped at a Walgreens to get some necessities that we forgot, and well, knowing me, I made a beeline straight for the nail polish display! I picked up two of the Wet n’ Wild Megalast polishes and a Maybelline Color Show Polka Dots Collection polish. I’ll swatch and review the other two later, but today I just have this beautiful blue. “I Need a Refresh-mint” (Wet n’ Wild really takes it on the naming department, all of their polishes have such creative monikers, it’s ridiculous!) 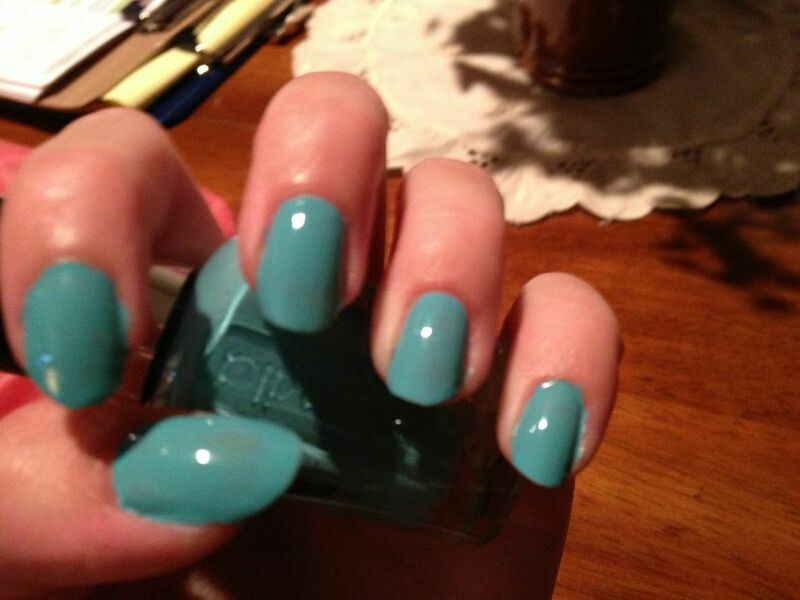 is a minty-toned sky blue. It’s perfectly creme, with no shimmer or glass flecks in it whatsoever. And boy is it a good creme. The pictures I’m showing you are one coat. That’s right, ladies and gentlemen. ONE COAT. While it’s the slightest bit patchy on some nails, it really is wearable with only one coat of polish. And the brush is perfection as well. 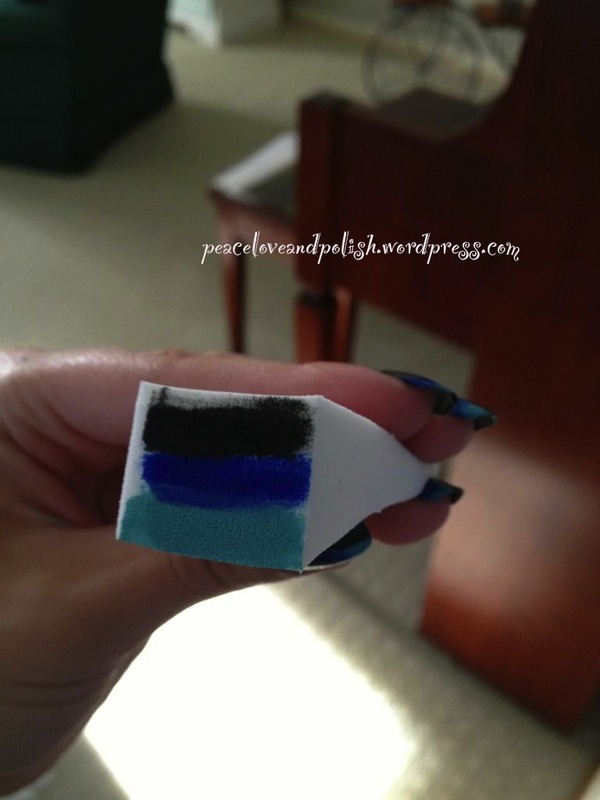 The brush is wider than a typical brush (from, say, OPI or China Glaze or really most polishes on the market). It makes it easy to stop painting the polish on just shy of the cuticles, and in my opinion, cuts down on the mess. I have a few (blurry) pictures of the brush to show below. This robin’s egg blue is a real winner in my book. 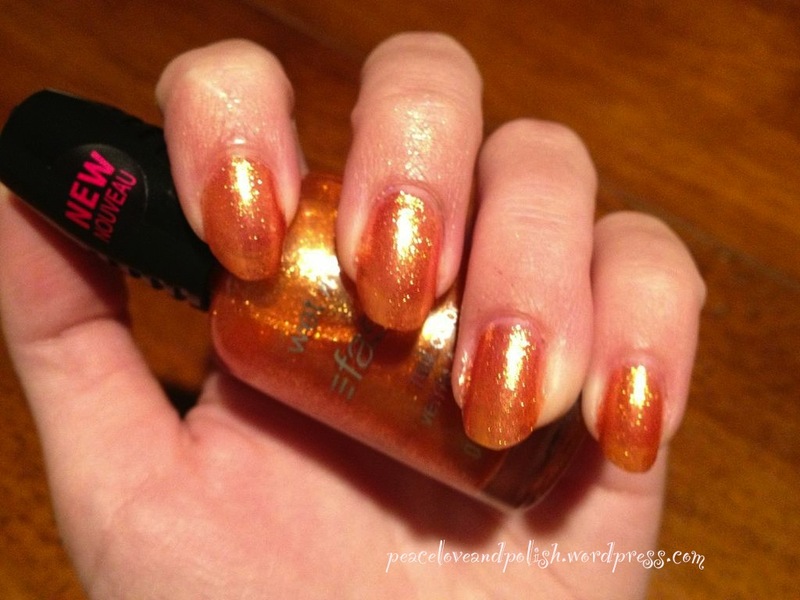 I’ll most definitely be purchasing Wet n’ Wild Megalast nail polishes again in the future! What do you think of this color? Is this type of blue your style? And have you had as positive an experience with this brand as I have? Let me know! 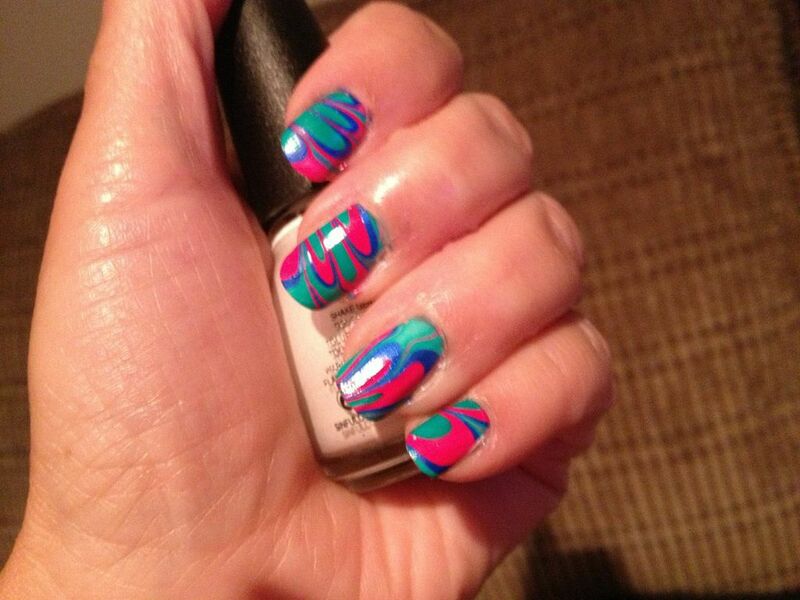 Nail Art- Water Marbling with my Mom! Today I have a special treat for all of you. Over the weekend, I got the opportunity to practice my water marbling technique on some very willing test subjects, er, willing volunteers. 🙂 I did manicures on both my mom and one of my good friends, Tory, but today I’ll just be showing you my mom’s, and saving Tory’s nails for later (solely because I’m too lazy to download those pictures to my computer right now, lol). To do the water marbling itself, I generally use room temperature, or slightly warm, bottled water. I just find that works best for me. I draw the designs using pointed toothpicks, since I am not a fan of using orange sticks, or something like that. I use tape around my cuticles to prevent excess polish from getting on my skin, and remove any mess around my cuticles with warm water in the shower (it peels right off and is less drying than using nail polish remover or acetone, in my opinion). Below are pictures in artificial light, no topcoat, of course, with my beautiful mom modeling for me! She makes a great hand model, no? I’m extremely proud of how this nail art turned out, I think my water marbling technique is greatly improving! What do you all think? 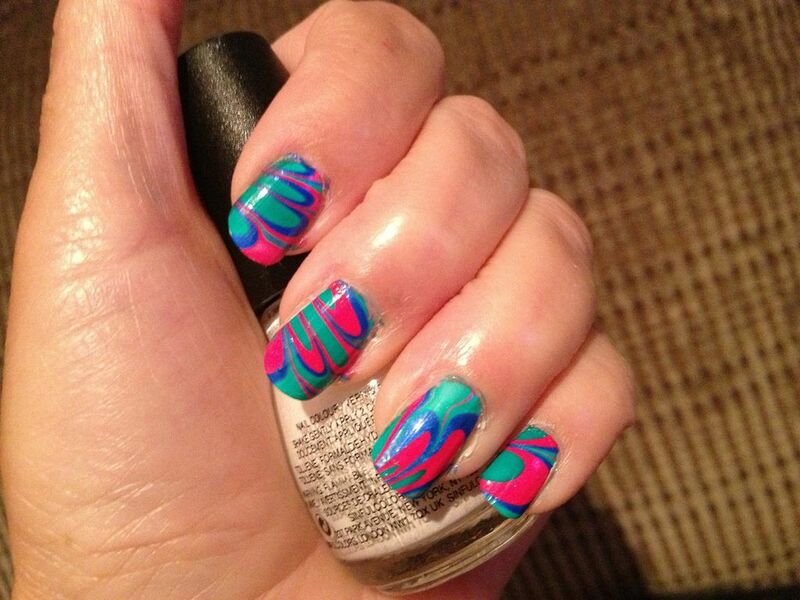 Are you a water marble fan? Are you going to try a bright summer manicure? 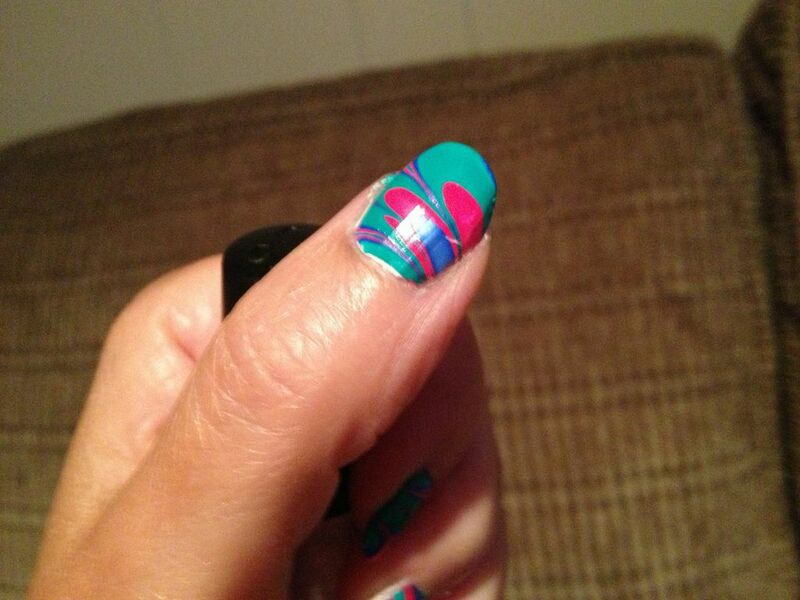 What nail art designs do you want to see from me in the future?